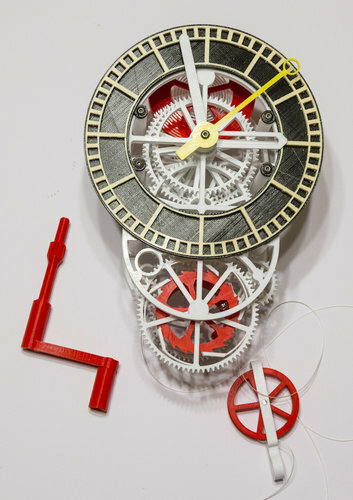 This was the first clock I printed. 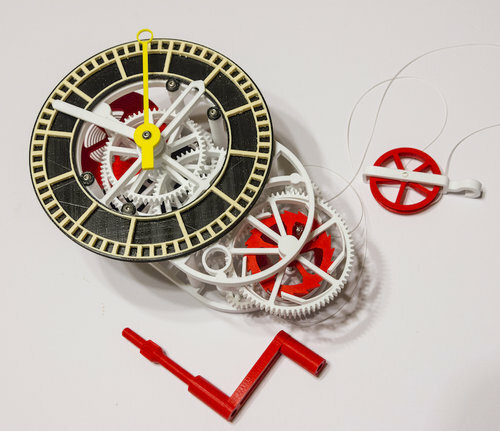 The designer is Christoph Laimer, aka 'The Goofy' who published it on Thingiverse a while ago. A much more forgiving design than his pocket watch. I used a 1.3Kg block of wood as the weight and it runs for several hours. On this build, I eventually re-designed some of the gears in Sketchup in order to get tighter tolerances, mainly on the co-axial hours-minutes-seconds gears. The frame is held by M3 bolts and the pins were stainless steel. However, brass would have been a much better material to work with. The key to get it working is to make sure the anchor and escape wheel have very low friction. All the hands were supposed to be yellow but I had to re-print them and had run out.